This is so beautiful. Great stamp combination and gorgeous design. Beautiful card!! !Thanks for the chance to win!! 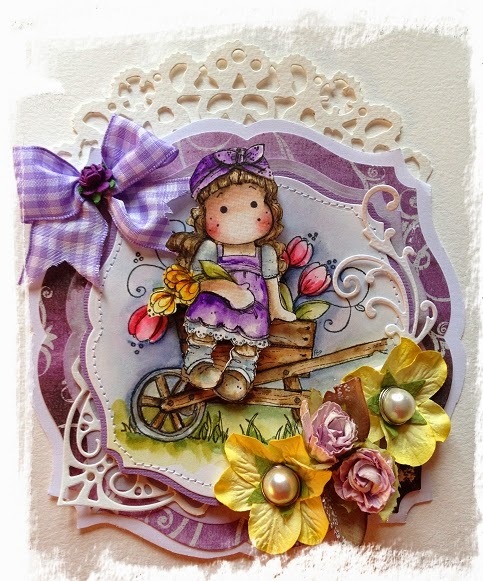 Gorgeous card Sirpa, love how you've perched Tilda on the wheelbarrow! Sirpa.. I always love your design! one of a kind and it so sweet! So delightful! Your coloring is so pretty, love the great detail. A beautiful Easter creation..love the colors! Beautiful card Sirpa with this sweet Tilda, Love your color combo! Gorgeous Tilda with purple and yellow color theme. Gorgeous, what a beautiful Spring card! 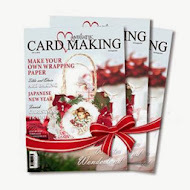 Your card is so beautiful. Love the flowers you have used. Beautiful combination of the Stamps !! FAB strong colors!! Lovely Coloring !! Great Details and colors!! What a lovely card!!! I love colours and design! your work is so cute!! She is lovely! Thank you for sharing! 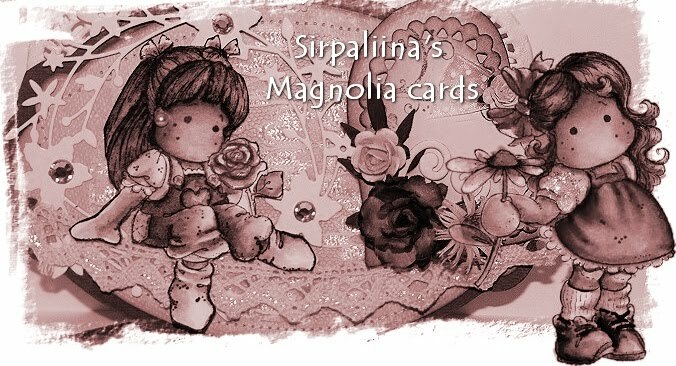 Fabulous bright and cheerful card, wonderful shape and stamp choices. Love it. Gorgeous card, love it! Such a sweet image and so beautifully embellished. Thank you for sharing and I have fun to join the hop! What a gorgeous card you made, love your colloring. What a beautiful spring card. Love your shape and the purple color. Love this! The colours are great! I love the wheel barrel you added to the little girl. Have a wonderful Easter! Great card, love the masking. Beautiful coloring, Sirpa. Love the 3D effect. Beautiful card! Your coloring looks fabulous. Stunning card. Love the vibrant spring colors. Beautiful card, love the spring colours! Lovely card, love the image and colours! Love the purple hue card, and a wonderful coloring too. What a Gorgeous Card and Stunning Colours! Hope you have a lovely Easter! This is great! What a vibrant colors you've used! Nice card, fun to see that you usel so vibrant colours.